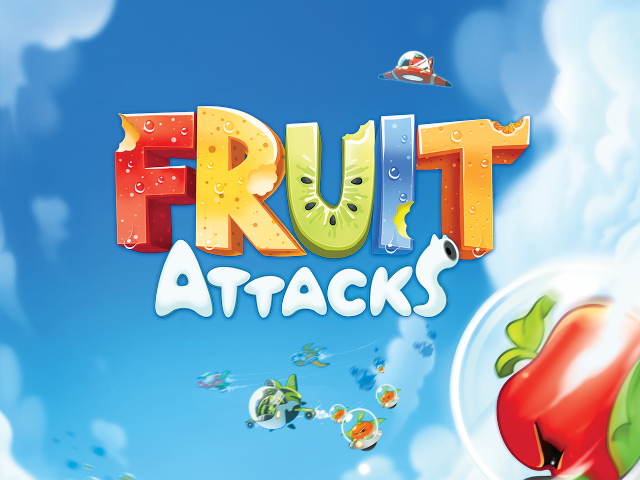 Fruit Attacks challenges players to defend Earth from an army of fruit aliens in 180 levels. TERA publisher En Masse Entertainment has announced the release of its first mobile game: Fruit Attacks. The level-based Earth defense game sees players defending the planet from fruit aliens by tapping and holding on the screen to strategically aim and fire at enemies. Fruit Attacks offers 180 stages at launch. In each level, aliens will move from the top to the bottom of the screen in an attempt to attack Earth. Players tap and hold with one finger to create a general trajectory line toward the (usually moving) enemies, while tapping and holding a second finger causes an arc in the aiming line. As players move their fingers, their aim changes accordingly, allowing them to line up the perfect shot. Once the shot is lined up (keeping in mind the movement speed of moving enemies), players release their fingers to fire. If players hold their fingers on the screen for a few seconds before firing, the shot does greater damage, which is useful when attacking stronger enemies. The planet is surrounded by a shield, which takes damage as aliens reach the bottom of the screen. If the shield is destroyed, the level ends, and players must begin again or spend premium currency for an instant revival. As players complete levels, they’ll collect blueprint pieces to unlock additional characters, or SATI, each with different standard attacks and special abilities. A special ability bar charges as players progress through each stage. Like tapping and holding for a stronger shot, this bar also rewards patient players, as users can wait for the bar to fill three individual times to supercharge the ability. Players lightly shake their device to trigger the ability, which causes a different effect, like stunning or freezing the aliens, or rewarding players with free currency, depending on the playable character. Gamers collect Golden Seeds and Gem Seeds, the game’s free and premium currencies, as they complete stages. Both currencies can be used to purchase mini-SATI helpers, which come with their own special bonuses when equipped alongside the main SATI. Some of these bonuses may see players doing more damage to strawberry attackers, or may extend an alien’s ‘stun’ time, as examples. Players can spend Golden Seeds to upgrade each mini-SATI, or spend Gem Seeds to change their bonus to another random option. Players can also spend Golden Seeds to upgrade the overall attack power of their main SATI. In addition, Gem Seeds can be used to purchase more Golden Seeds outright, or to refill the game’s energy bar, so gamers can continue playing new levels without waiting. Fruit Attacks is available to download for free on the iTunes App Store, Google Play and the Amazon Appstore.